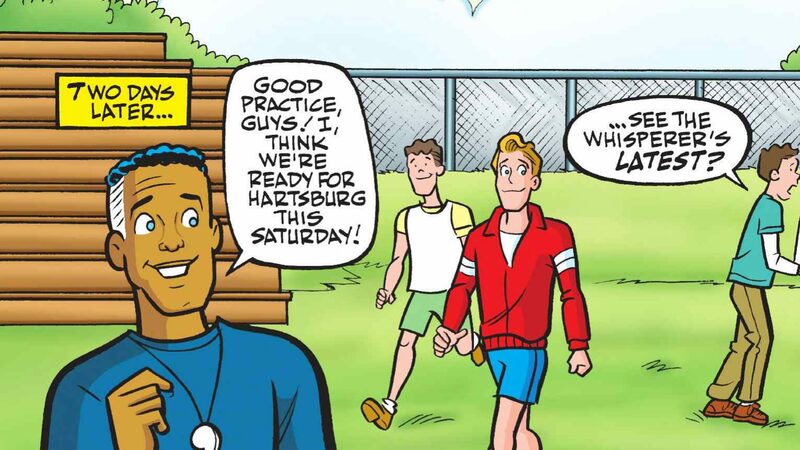 This week’s minorities in cartoons entry is Coach Clayton, the father of Archie Comics character Chuck Clayton. According to a Grand Comics Database search (unless it’s an error), Clayton first appeared in “Pep” #258 (October 1971), in a story drawn (and likely written) by Al Hartley. As the above indicates, Coach Clayton works at Riverdale High School as a sports team coach and gym teacher. He’s meant to serve as a modern-style, in-shape athletic supervisor. That’s as opposed to the series’ original one, the heavy-set (and punny-named) Coach Kleats. Kleats and Clayton are shown working together, however, with Kleats handling most of the school’s football duties. Clayton is mainly in charge of the school’s basketball and wrestling teams, as well as serving as a gym teacher. Unlike most of the more famous Riverdale High faculty, Clayton’s married; his wife is a rarely-seen woman named Alice. In 1989, Coach Clayton and several other school staff members (Ms. Grundy, Mr. Weatherbee, and science teacher Professor Flutesnoot) starred in “Faculty Funnies,” a five-issue series where the quartet briefly gained superpowers and fought crime. Clayton had super-breath; Grundy had stretching abilities; Weatherbee had super-intuition; and Flutesnoot could generate force fields. In the final issue, the powers (granted by a science fair experiment of Archie’s backfiring) vanish. If you’re wondering, this was made during the same era that gave us the admittedly-fun-but-short-lived “Jughead’s Time Police” (Jughead as a “Timecop”-esque time-traveller). Coach Clayton’s first non-comics appearance was in the 70s Filmation “U.S. of Archie” series. For whatever reason, Mr. Clayton here is a pilot (in an episode about the Wright brothers’ first flight), rather than an athletic supervisor.